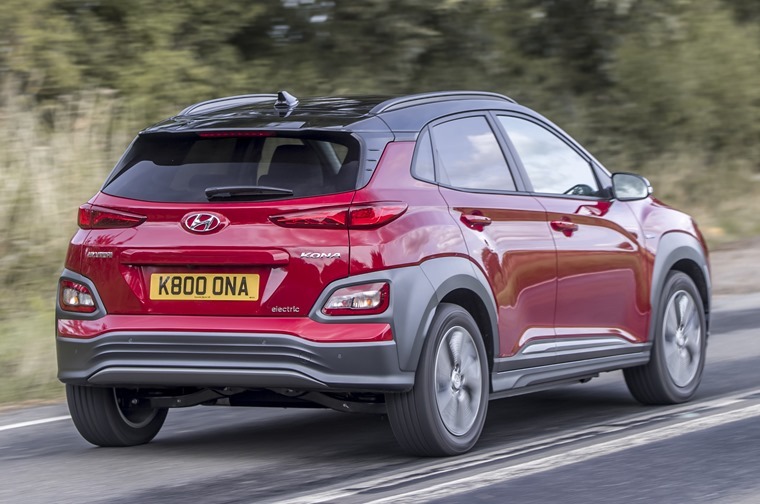 The Hyundai Kona EV offers a compelling blend of usability and economy. With a claimed range of 279 miles, few other affordable electric vehicles can compare. It has been amazing seeing the gradual growth of the electric vehicle market over the past five years, with each new launch bringing something different, new and unique to the market. Each manufacturer – whether it’s Tesla, Jaguar or Nissan – seemingly throwing the gauntlet down to others challenging them to do better. So far, Nissan has cornered the mass-market in regard to early adopters of electric cars with the Leaf, a model which we said normalised the electric car in every conceivable way in our review last year. Now there is a new pretender to the throne. It’s priced right, it has a desirable crossover bodystyle, and it also offers the best mileage range out of any of the other affordable EVs on the market. 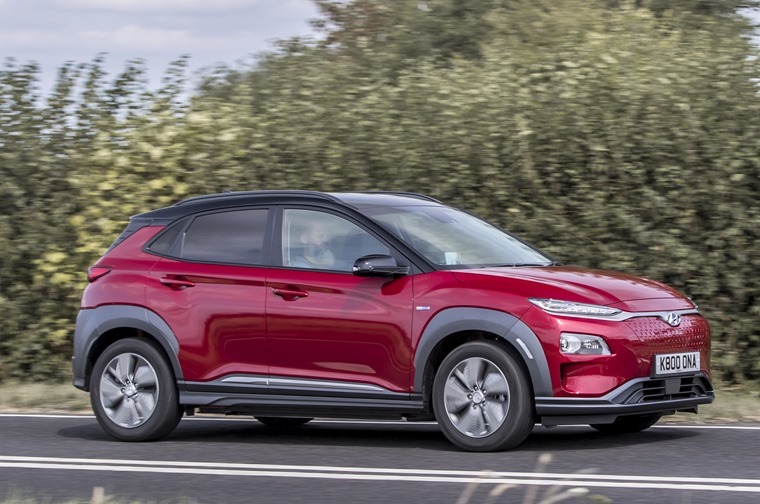 It is the Hyundai Kona Electric. Already familiar with the general look and appeal of the Kona, we were surprised to find that the platform was originally designed for this EV and not the ICE we drove last year. Time hasn’t done much regarding people’s acceptance of the front end of the car. The slim split headlights continue to divide opinion and the closed grille confuses people. 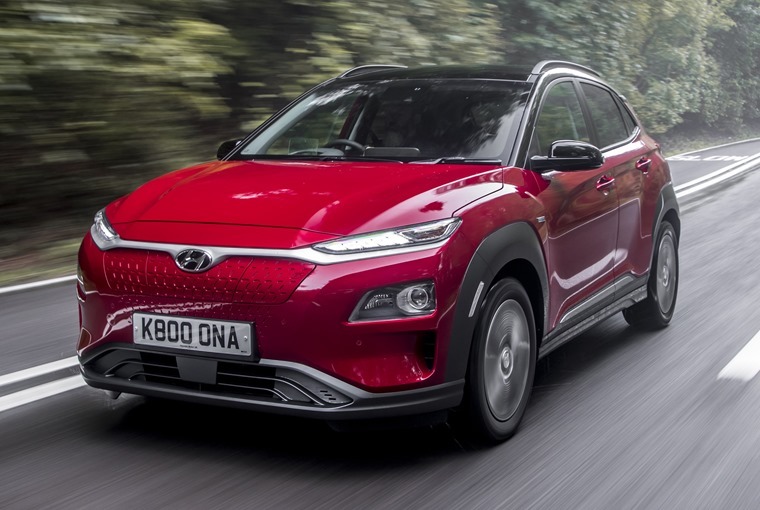 It confuses them because the Kona’s secret weapon is that it’s possibly the least-EV-looking electric car on the market thanks to its shared platform and prevalence of small crossovers on the road, and it is there to provide additional aerodynamic ability to get the most from the range. So too are the unique 17in alloy wheels, which reduce drag. Ah yes, the most pressing question then: the range. With a claimed WLTP range of 279 miles from the 64kWh battery model we tested, our real world range was somewhere around 245 miles accounting for the winter weather and frequently using the heated seats and having the heating on low consistently. Hyundai’s Virtual Engine Sound System (VESS) provides a melodic driving sound so that pedestrians and vulnerable road users know you’re there. This can be replenished using a 7.2kW on-board charger and the same CCS Type 2 connector found on BMW and Volkswagen’s early forays into the world of alternative-fuelled vehicles. Using this with a rapid charger will get you a full charge in 45 minutes. If you have a 7.2kW wallbox, that will increase to 10 hours 30 minutes (a rate of 23 miles per hour of charge). If you’re crazy enough to solely rely on a three-pin wall plug then you’ll be looking at going from 0-100% charge in a 32 hours 45 minutes (a rate of 7 miles per hour of charge). The joy of the immediate torque makes you want to use it more often, but you have to manage your impulses to get the most from the car and the battery. We’ll call it the EV Paradox. With great power comes great responsibility, as the old saying goes. On the road then, rapid is the word. The joy of the immediate torque makes you want to use it more often, but you have to manage your impulses to get the most from the car and the battery. We’ll call it the EV Paradox. With great power comes great responsibility, as the old saying goes. This 64kW Kona offers around 200hp and immediate speed on tap at the twitch of an ankle. Lift off the accelerator or use the paddle-shifters and the car will use regenerative braking to slow down and recharge the battery. You can toggle the severity of this breaking between 1-3, with three being a little too harsh and one being a bit more comfortable. Having the car in Eco mode, which is what I assume most drivers will use, keeps it at two which again verges on being a little too harsh at times. As for the range of the vehicle, and it’s usability as a daily driver across a variety of distances and road types, we covered this in-depth in our commuting diary. To paraphrase: it’s the first time getting in an EV long-term where range anxiety didn't figure, besides driving a Tesla, of course. With a 60-mile daily commute on motorway and residential roads, it had no issue. It even had me wondering if I could get away with running the car down throughout a week of commuting and just recharging it at the weekend. I reckon you’d be be pushing it but if you were smart and restrained in your driving I think it would be achievable. 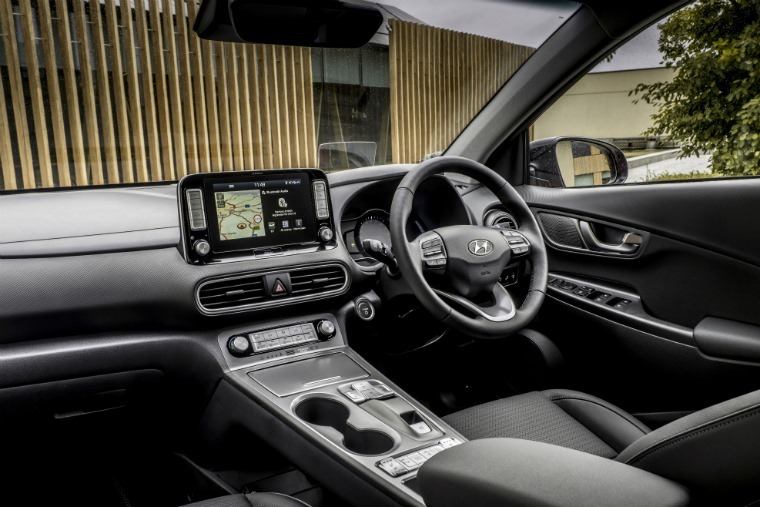 When it comes to infotainment and in-car tech, the Premium SE Kona EV features a 7in touchscreen infotainment system with a DAB radio and Apple Carplay/Android Auto smartphone mirroring. Everything is to hand on the centre column, from the usual heated seats to the electric parking break and gear and drive mode selector. It’s as equally as practical as the regular Kona and just as compact, with two adults and three children able to sit in comfort. At the rear, the boot offers 332 litres of space with the seats up which is somewhere between a supermini and a hatchback. One thing the Kona does lack in comparison to the Nissan Leaf is in innovations, with nothing similar to Nissan’s e-pedal or ProPilot. Maybe this is on purpose, to not overwhelm early adopters and ensure their transition into an EV remains as car like as possible. 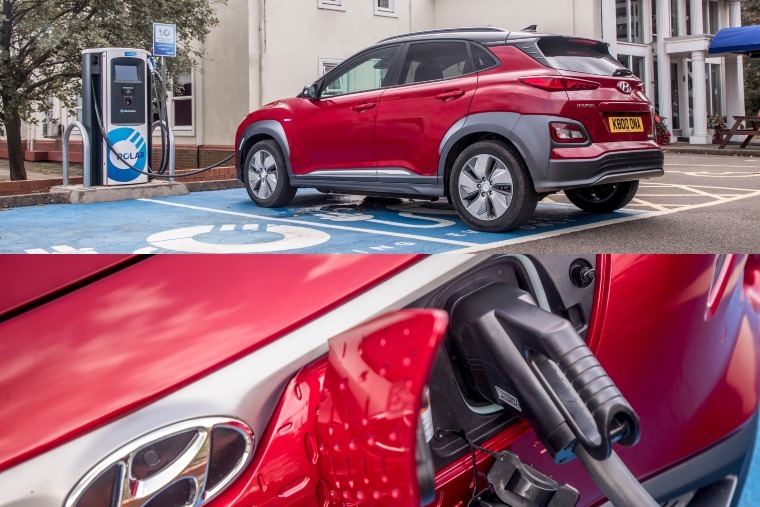 And as cool as the Inteligent Mobility solutions in the Leaf were, are they worth the trade off regarding the extra 111 miles of range the Kona offers? We’re not so sure. 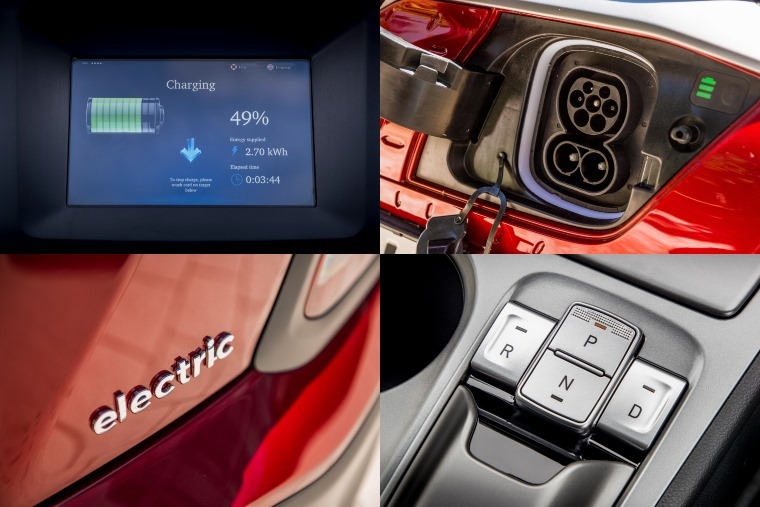 It’s hard for reviews of EVs not to come across as overly complicated maths equations when talking about the range, or as a bit cliched with incessant talk of the quiet, the charge, or the torque. But they are still a novelty and it is hard not to focus on this. As they become the norm, and the internal combustion engine slowly reverses into the background, how we talk about these cars will change. Hyundai has made the next big leap on our journey toward this. Popular small crossover looks ensure the Kona EV is on trend, though elements of the front of the car can be divisive. Everything is laid out logically and within easy reach of the driver with all the mod cons you expect and want. It can feel a bit cheap in places but with the main aim to offer an affordable EV it can be forgiven. The Kona is fun and fast, though a little sluggish from the off when using Eco or Comfort driving mode. The tethers come off in Sport mode but your mileage range will suffer. Plenty of space for a family of five, with the boot hovering between a supermini and crossover in size with the seats up. With 245 miles of real-world range available, few other electric vehicles can compete with the Kona with this battery installed.